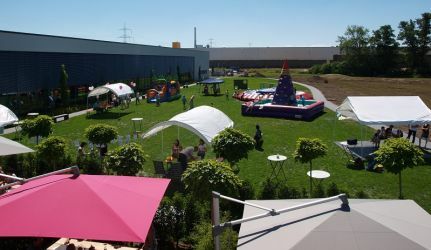 On 30th of June Thermo Sensor invited all employees including their families for the company’s family day. Under a lovely sun, everybody had the opportunity to get impression of the new site. Also, the children were entertained: a make-up artist turned the boys and girls into different animals, the kids created their own paintings or just had fun on one of the three jumping castles. The visitors were also entertained by the magician Flash Gonzalez and the children’s songwriter Thorsten Kremer. Altogether a successful event for young and old. 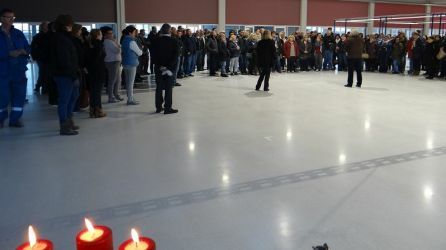 On 15th of December all employees were invited to a reception in the new bulding and had the opportunity to get an impression of their new working places. The restaurant team served delicious food which everybody enjoyed. We were pleased to present our company during this year's job fair in Werne on 9th November. Around 160 pupils have informed themselves on our booth about the the apprenticeships we are offering: technical production designer, industrial mechanic, industrial clerk and mechatronic. They also had the opportunity to solve a work-related task independently. The students were guided by two of our apprentices. We were pleased to note that a lot of girl students are interested in a technical-oriented profession and they were not less skilful in solving the task than the boy students. The fair was a great success for us and we hope that we could gain new apprentices for our company. On 22nd July all employees were invited to the company's construcion site party to have a look behind the scenes and into the new building. Everybody was impressed by the huge size of our new company site and the imposing buildung with its glass facade. Thanks to the room design plans which were hanging on the walls the employees were able to get an impression of how their workplaces will look like in half a year. All our employees are looking forward to moving into the modern building.